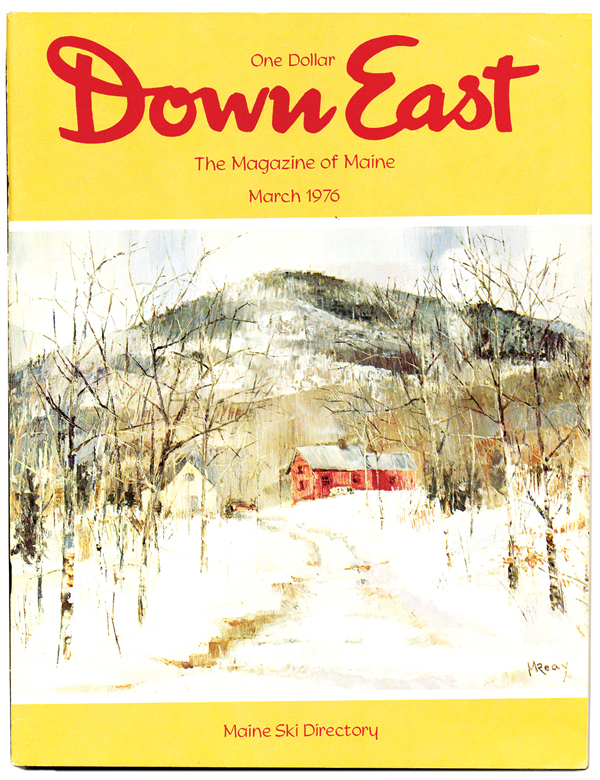 From “Maine’s Champion Freestyle Skier,” by John A. Gould, in our March 1976 issue. [T]here, between two green parkas, over the racing bib and the silver bowl, is the smile: warm, spontaneous, and ebullient, beside which even a fresh-struck penny would seem lackluster. The smile belongs to Karen Colburn, 18, of Bangor, and she is wearing it because she has just won that silver bowl, the Olin Cup, given for “Outstanding Achievement in Skiing.” Karen’s achievement is that in March of 1975 she went to Killington, Vermont, and won the Girls National Freestyle Ski Championship. To be a national champion anything — runner, skier, sailor, stone-skipper even (and there is a national stone-skipping champion) — demands at very least a great audacity, at most a great talent, drive, and sacrifice. Karen’s smile reveals a grace in victory, derived in part from her personality, in part too from the brand-new sport of freestyle skiing, so new that she is the first person to hold her title. This From Our Archives piece appeared in our March 2016 issue. At the time, Colburn, lived in Camden with Coco, her 13-year-old-son, who has Down Syndrome. After 13 years off the hill, she’d started skiing again at Camden Snow Bowl, giving lessons to Coco. That year, she hoped to bring her father and son to see the U.S. Ski and Snowboard Hall of Fame induction in Aspen.